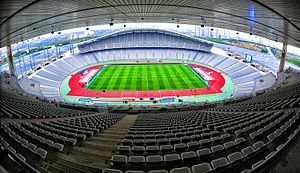 The Atatürk Olympic Stadium (Turkish: Atatürk Olimpiyat Stadı) is a sports stadium in Istanbul, Turkey. It has a seating capacity of 76,092. This makes it the biggest stadium in the country. Building began on the stadium in 1997. It was completed in 2002. It mostly plays host to football matches. It is the home stadium of the Turkey national football team, and formerly to Galatasaray, Beşiktaş and İstanbul Başakşehir. The Atatürk Olympic Stadium was named after Mustafa Kemal Atatürk. On 25 May 2005, the stadium held the 2005 UEFA Champions League Final between Milan and Liverpool. ↑ "AC Milan 3-3 Liverpool (aet)". BBC. 25 May 2005. Retrieved 28 November 2017. Wikimedia Commons has media related to Atatürk Olympic Stadium. This page was last changed on 27 April 2018, at 06:21.